A cross-party group of MPs has delivered a report to Tony Blair calling for action to tackle an increase in anti-Semitism in the UK. The panel of 14 MPs said the "disturbing" rise had been exacerbated by the situation in the Middle East. It also said a minority of UK Islamist extremists had incited Jewish hatred. Labour backbencher Denis MacShane said abuse took "classic forms" such as synagogues being vandalised and school children being spat at and insulted. The panel's report has been welcomed by Chief Rabbi Sir Jonathan Sacks, who said the Jewish community would "fight prejudice in whatever form it takes". The former Conservative leader, Iain Duncan Smith, who was one of the members of the panel, said the situation regarding anti-Semitic attacks was worse than he had previously believed. "A combination of complacency and ignorance seems to be the name of the game here," he said. "Many police forces simply keep no record of these attacks at all and therefore are unable to understand the depth or the strength of the nature of the problem. "We found there was a very low level of prosecution seen through to their final end. It was almost as though they would shrug and leave it because it was just too difficult." Key recommendations in the panel's 60-page report include improved recording of anti-Semitic incidents by the police, better education about anti-Semitism in schools, a crackdown on anti-Jewish activity on university campuses and action to prevent the spread of anti-Semitic material online. 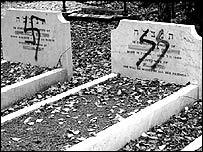 The All Party Parliamentary Inquiry into Anti-Semitism was set up in 2005 to investigate the nature and extent of contemporary anti-Semitism. 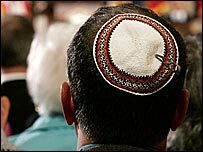 It was established against a background of steadily rising anti-Semitic attacks which reached a peak of more than 530 incidents on members of the UK's 300,000 strong Jewish community in 2004. Since then the number of incidents have fallen but remain at high levels, according to figures from the Jewish-led Community Security Trust. In addition to more than 100 written submissions from organisations and individuals, the panel of MPs heard oral evidence in four sessions in February and March. Among those who gave evidence were the then Home Secretary Charles Clarke, the Attorney General Lord Goldsmith, Chief Rabbi Jonathan Sacks, race watchdog chief Trevor Phillips and the former head of the Muslim Council of Britain Sir Iqbal Sacranie. They called for the adoption of a clearer definition of anti-Semitism by the government and law enforcement agencies which reflected its "complex and multi-faceted" nature. "Anti-Semitism is not one dimensional. It is perpetrated in different ways by different groups within society and for this reason it is hard to identify," the report stated. The MPs said it was "inexcusable" that there was not a requirement for all police forces to record anti-Semitic incidents given that such a duty existed for racist crimes. And they called for an investigation by the Crown Prosecution Service into the low number of charges being brought for anti-Semitic abuse, saying fewer than one in ten incidents resulted in a prosecution. In an earlier version of this story we mistakenly attributed comments to Dr MacShane about British Jews being the focus of anger as a result of Israeli and US foreign policy. We would like to make clear that Dr MacShane did not make these comments. We have amended the story accordingly and apologise for the error.